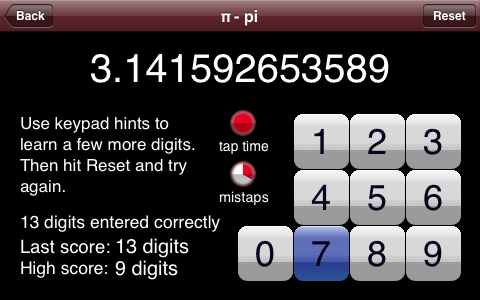 Ok, so say you haven’t used NumMemorize and can’t recall any digits of pi. 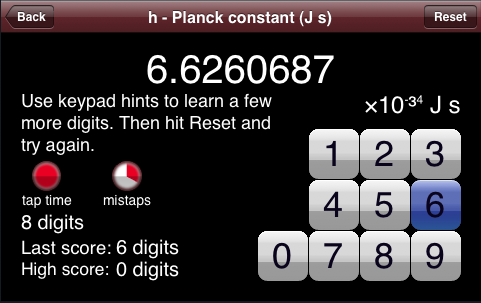 Well, here is one way to calculate pi – without any fancy high tech gadgets – just by tossing hot dogs. Wow. How does her brain file all those digits away? The tap pad keys are too small. That was the comment from two testers. And nothing else. One person did complain about the buzzer being too jolting, but I like it that way. Call it conditioned response: You learn the number well or else you get buzzed. Yes, the screen size does shrink, and you better be prepared for it! I had to adjust my view to deal with this. Now my app has some extra space along the top of the number. In the next release, I will have to do something a bit more elegant. Surprisingly, Apple’s default style for buttons on the iPhone is pretty bland. Which is not the case for many Apple provided apps. So, while Apple is providing us developers with a bland style, they are going into some trouble to make their buttons look nicer. Why Apple doesn’t just provide two or three styles of buttons, is beyond me. 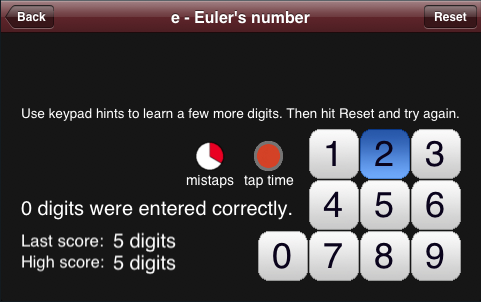 The app is pretty much complete. I’m making a list of people to test it. The thing that I find funny is how I have probably spent over 2 or 3 times as much time trying to do the graphic design work as I have on the actual source code that runs behind the graphical interface! I think it would be nice if I could find myself a competent graphic artist – I’m not one. The majority of the past couple of days have been spent arranging and rearranging the graphical UI elements of NumMemorize. Yes, I fret too much over the GUI. I definitely like the symbols better this way, although the center column could have been left untouched. I’ll be curious to see the comments from the users. I won’t go over the different controls and textual displays right now. Suffice it to say that pretty much everything you see is actually connected and functional. 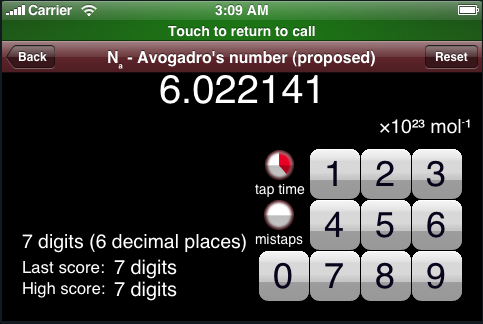 I even have keyboard hinting working – once the user has made too many mistakes or is out of time, the key will start flashing the next digits of the number as a way to teach the user additional digits. a small animated clock/timer graphic to signify the time left before the user has to press a key or entry mode ends (and teaching mode begins). I am also pleased to announce, that our little app here now sports its own icon. I have to add that this icon took me almost a whole day to design, no thanks to Adobe products. For some reason none of the Adobe CS products launch on my MacBook anymore. They open and quit. Neither does Photoshop Elements. I spent an hour or more deleting and reinstalling Photoshop CS, and I had the same issue. I downloaded a number of other graphic and icon editing apps, but then I realized that GraphicConverter, right under my own nose, is fully capable of creating graphics suitable for this purpose. Thanks Thorsten Lemke! One last comment before I call it a night. Quite often I find a need to look at a string of text in all different fonts in order to pick the most suitable rendering. The icon above was created by going through many, many fonts, one-at-a-time, in order to find the right one. I wish there was a way to either say, take this string and run through each font automatically, pausing between each, or to render the string in all possible fonts, in one document, and then allowing me to delete ones I dislike or copy the one I do. Is there such an app, or a feature in an existing app?